(VACNE) - Heritage Magazine No. 6 (May 2017) of Vietnam Airlines is attracting domestic and international visitors thanks to the cover photo of Vietnam Heritage Tree. This is the Bodhi tree of the titular temple of Phu Hau village, Lap Thach district, Vinh Phuc province, recognized by VACNE as Vietnam heritage Tree in October 2016. Ancien trees growing near ticular temples are typical sights in small rural villages in northen Vietnam. In April 2016, the Open Sky Magazine No. 41 of the Vietnam Airline Business Association also published photos and articles on Vietnam Heritage Trees, "Son Tra Banyan Tree - Danang Tourism Destination." 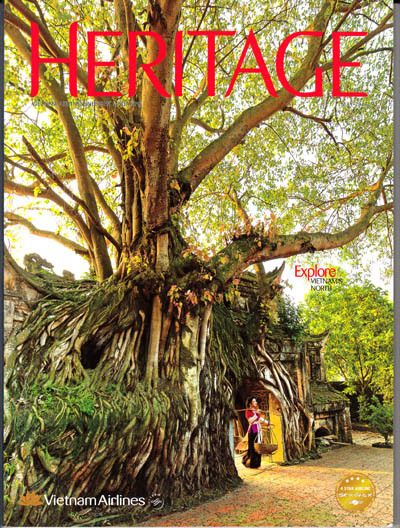 The publication of images and articles about Vietnam Heritage Trees recognized by VACNE in the magazine of the Vietnam airlines, has directly promoted tourism development, contributing to promoting the Biodiversity and history - culture of Vietnam. The Taxi drivers in Da Nang said that after being recognized as a Vietnamese Heritage Tree, the Banyan Tree for nearly a thousand years on the Son Tra Peninsula has become an attractive tourist destination. Especially, when it was introduced by the magazine Open Sky of the Association of Vietnam Airlines , the number of visitors rent Taxi to visit and take souvenirs at the base of Banyan Tree is increasingly crowded.